1-1-1.Reduce the amount of CO2 emissions in the product lifecycle to achieve the Year 2020 Environmental Impact Reduction Goals. Reduced the amount of CO2 emissions through the product life cycle by 44.3% in fiscal 2016 compared with the fiscal 2000 level, thereby achieving the target. 1-2-1. Reduce CO2 emissions in society overall by developing and providing environmentally friendly products and solutions. a) Develop and provide products with improved energy-saving performance. b) Increase emissions reduction by changing customers' work flow. a) Launched products with high energy-saving functions throughout the year, and all of our multifunction printers have become registered products in the International ENERGY STAR Program. Reduced the amount of CO2 emissions in use by approximately 13% compared with the previous year, thereby achieving the annual plan. b) Reduced CO2 emissions by 467,000 tons (equivalent to 1.4 times the total amount of CO2 emitted from Ricoh Group factories around the world) in fiscal 2016 through the provision of videoconferencing systems, paperless solutions, and other products/services. Will continue working to expand emissions reduction through the provision of products/services that can change office workflows. 1-3-1. Reduce greenhouse gas emissions caused by production activities (manufacturing subsidiaries in and outside Japan). [Target: Reduce greenhouse gas emissions in manufacturing processes to 330,000 tons or less. Reduced to 318,000 tons-CO2 in fiscal 2016, thus achieving the target of 330,000 tons-CO2. 1-3-2. Reduce the amount of CO2 emissions in sales and distribution processes (non-manufacturing subsidiaries in and outside Japan). Japan: Reduce the amount of CO2 emissions in sales and distribution processes to 38,000 tons or less (decrease of 35% compared with the fiscal 2000 level). Japan: Reduced to 39,000 tons-CO2 in FY2016, not achieving the target of reducing to 38,000 tons or less. Will continue further efforts to reduce CO2 emissions. Overseas: Created a system to assess the relevant current situations necessary for setting targets. 1-3-3. Improve the energy management system. Reviewed the current electricity contracts at each site in terms of cost and CO2 emissions and have started to examine the possibility of using the new power supply service. 2-1-1. Reduce input of new resources for products to achieve the Year 2020 Environmental Impact Reduction Goals. Reduced input of new resources by 3.7 times the fiscal 2007 level, achieving the fiscal 2016 input reduction target of 3.2 times. 2-2-1. Reduce waste generated from business activities. The amount of waste proportionate to sales increased by 0.8% from fiscal 2015, thus not achieving the target, while the total amount of waste decreased by 7.4%. Will continue further efforts to reduce cost and waste of resources alike. 2-2-2. Reduce the amount of water used in business activities. Increased water use proportionate to sales by 10.5% from fiscal 2015, failing to achieve the target. Will step up efforts for water usage reduction. 3-1-1. Reduce the amount of environmentally sensitive substances used and emitted. Reduced usage to significantly below the fiscal 2010 level, thus achieving the target. Reduced emissions to below the fiscal 2010 level, thus achieving the target. Will continue efforts for usage and emission reduction. 4-1-1. Use wood-based products carefully in consideration of biodiversity. As a member of the Japan Business Initiative for Biodiversity (JBIB), participated in the formulation of the Corporate Procurement Guide for Promoting Biodiversity Conservation. Revised the internal regulations relating to procuring wood-based products in accordance with the Guide to promote biodiversity conservation. 4-1-2. Consider biodiversity at all Ricoh Group operational sites. Included in the site management guideline provisions on the removal of invasive species and reduced use of chemical pesticides. Implemented management under the modified guidelines at a total of 32 Group sites. In fiscal 2016, at 13 and 7 locations in Japan and overseas, respectively, no chemical pesticides were used and only pesticides complying with IPM* are used in the management of the premises. * Pesticides with a low negative impact on the ecosystem in accordance with the IPM (Integrated Pest Management) concept. 4-1-3. Conduct biodiversity conservation activities with local societies, using company forests. It was the third year of the biodiversity conservation activities in Ricoh Ena Forest, owned by Ricoh Elemex Corporation in Japan. We systematically conducted forest conservation activities in cooperation with local residents, held nature observation events for children and strolling events for community people, which attracted many participants. 4-1-4. Develop preservation activities for forest ecosystems. The six ongoing forest ecosystem conservation activities progressed as planned. Yanbaru forest in Okinawa was designated as Yanbaru National Park by the Ministry of the Environment in September 2016. Environmental education for children, to which Ricoh provides support, has been a great success. As a memorial event, employees of the Ricoh Group conducted a tree-planting activity with local residents in Ogimi village in February 2017. 4-1-5. Conduct biodiversity conservation activities in cooperation with stakeholders. Conducted biodiversity conservation activities, including planting, conserving rural landscapes, river/forest/coastal cleanups, and removal of identified invasive species in 22 countries. A total of 9,500 Group employees and 3,400 stakeholders, including customers and employee family members, participated in these activities. 5-1-1. Promote the development of environmental technologies to create a sustainable society. - Completed demonstration tests of Energy-Generating Rubber (flexible piezoelectric body) and shifted to the stage of practical use (exhibited it at the Eco-Products exhibition in 2016). 5-2-1. Expand the resource-recirculating business. Worked to achieve global optimization of reuse/recycling businesses that have been expanded into various parts of the world. As a result, achieved a total reuse amount of 6,187 tons from sales of recycled copiers. 5-2-2. Expand the provision of customer values from an environmental point of view. Added Sustainability Optimization Programs (SOPs) and carbon offset proposals to the menu to develop them globally. In addition, we received the Gold rating in the supplier sustainability survey conducted by EcoVadis, as in the previous year, enabling us to meet the request of our customers for performance assessment by the sustainability rating company. 5-3-1. Collaborate with external groups to help bring about a sustainable society. - Participated in the World Forum for a Responsible Economy, a forum organized by a French NPO to promote the establishment of a sustainable society, and widely introduced Ricoh’s sustainability initiatives. - Continually lobbied for active promotion of response to climate change to the government and high-level officials of international organizations through the Japan Climate Leaders’ Partnership (J-CLP). - Participated in the Ministry of the Environment’s ESG Working Group on Information Disclosure as a representative of advanced companies in terms of information disclosure and made proposals on ESG information disclosure in the future. - Made practical and constructive proposals as a company that discloses information when the World Resources Institute (WRI) formulated a guide for evaluation of avoided emissions. - Participated in a Workshop under the G7-Alliance on Resource Efficiency. 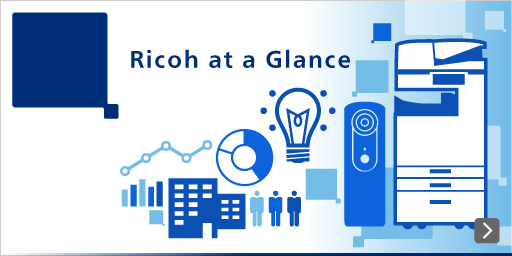 Introduced Ricoh’s product-oriented 3R—reduce, reuse, recycle—activities and received a high evaluation. - Held an ESG briefing session for analysts during the period of the Eco-Products exhibition and received very good feedback. 5-3-2. Promote environmental consciousness in society through the environmental activities of employees. Organized the annual Global Eco Action over the entire month of June, holding a memorial symposium at the RICOH Eco Business Development Center on June 5, the UN's World Environment Day. Also invited external guests to the symposium and attempted to promote environmental management activities connecting business sites of the Group companies by relay. Also, posted live updates on the Group’s global environmental actions on a dedicated Facebook page. 5-3-3. Consider the environment in supply chains in cooperation with suppliers. - Completed the assessment of 68 target companies at our production-related company in Thailand, thereby completing the implementation of risk management measures. - Targeting the Group’s 4 new suppliers, proposed and supported a shift to new electric power, which leads to reduction of CO2 emissions. As a result, we contributed to their reduction of CO2 emissions and costs.